In stage 2, Moula Ali-Malkajgiri-Sitaphalmandi, Bolarum-Medchal and Moula Ali-Ghatkesar lines would be taken up. “Reliance, GVK and GMR groups did not turn up,” Mr Appa Rao told this newspaper. “He said he will come back on Monday after talking to the management,” said Mr Appa Rao. The consortia qualified to present financial bids are 1) Reliance (Anil Ambani) group 2) GMR. 3) L&T, Lanco–OHL (Spain) 4) Essar Leighton (Australia)-Gayatri-VNR 5) GVK-Samsung (South Korea) 6) Transstroy–OJSC (Russia)-CR 18 (China)-BHML and 7) Soma-Strabag (Austria). 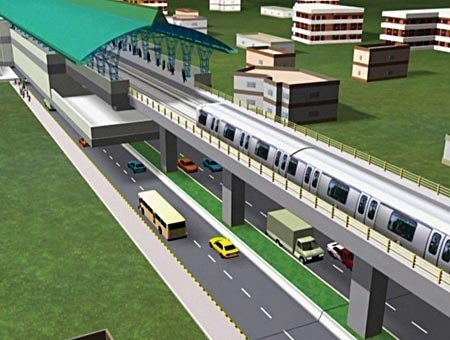 HYDERABAD: The Central government has given consent to the ‘Comprehensive Transport Study' for Hyderabad Metropolitan region and has also agreed to fund 50 per cent of the estimated cost of Rs. 7.62 crore. The municipal administration and urban development (MA&UD) department on Tuesday released the names of the eight short-listed companies—Transstroy-OJSC Transstroy-CR 18G-BEML Consortium, Reliance Infrastructure-Reliance Infocomm, Lanco Infratech-OHL Concesiones SL, Essar-Leighton-Gayatri-VNR consortium, GMR Infrastructure Ltd, GVK-Samsung C&T Corporation, Soma-Strabag AG (Austria) and Larsen & Toubro Ltd. Meanwhile, the GO issued by MA&UD said the pre-qualification of Soma-Strabag AG (Austria) consortium would be subject to the condition that it furnishes a fresh ratification Power of Attorney under the common seal of Soma Enterprises Limited within one month from the date of issue of Request for Proposal and another prospective developer Transstroy-OJSC Transstroy-CR 18 G-BEML consortium has to furnish fresh ratification of Lead Member POA by BEML under the common seal of the company, necessary supporting documents, submission of stand-alone audited annual accounts of China Railway Construction Corporation for the year 2008 along with statutory auditor’s certificate as proof of fulfilling the networth criterion as per RFQ within one month.